Oue Werf Country House is a peaceful homestead nestled in the charming Schoemanshoek Valley near Oudtshoorn. Marius and Annelie invite you to spend some quality time at their owner-managed guest house. Enjoy one of our eight luxurious double or twin rooms furnished with antiques; some rooms still have the original reed ceilings. All rooms have private entrances and are set apart from the main house. Thoughtful touches and constant attention to detail ensure a special romantic stay. The warmth and hospitality is enhanced by an abundance of fresh flowers throughout. Guests can enjoy a refreshing drink or a light lunch alongside the swimming pool during summer, and they can cuddle up under a blanket in front of the fireplace in the lounge while reading a book and enjoying a glass of sherry during winter. Soft candlelit dinners are served in our stylishly decorated antique dining room with its high-beamed ceiling and terracotta floor. This cosy facility was created for you to enjoy a superb home cooked country dinner on request. A hearty farm breakfast is served either on the patio overlooking the picturesque mountain scenes or in the dining room. We are situated within a radius of 15 km from all tourist attractions such as the Cango Caves, camel rides, a waterfall, Ostrich Show Farm, a game lodge, Crocodile and Wildlife Ranch, and the Swartberg Mountain Range. Always excellent . This is now our 6th year that we use De Oue Werf as an overnight stay, and will most probably never use any other guest farm. Probably one of the most pleasant places to stay in the Oudtshoorn area. Oue Werf Country House is 13.5km from the centre of Oudtshoorn , the nearest airport 60.2km (George Airport). 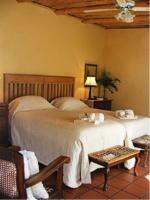 En-suite double room used for honeymoon couples as well as guests. It is beautifully decorated and has its own private entrance, coffee and tea-making facilities, a TV with M-Net, a ceiling fan and a DVD player. There is a bathroom with a shower and a bath.